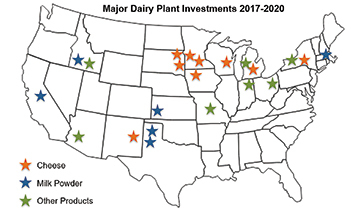 What’s next for U.S. dairy plant capacity? Mike McCully is owner of the The McCully Group LLC, New Buffalo, Michigan. He contributes this column exclusively for Cheese Market News®. Over the last few years, milk processing capacity, or the lack of it, has been frequently discussed. U.S. milk production continues to grow, the equivalent of more than 7.5 million pounds per day each year. The United States has added a significant amount of milk powder capacity in the last decade while recent investments have favored cheese. But given the uncertainties with exports, unfavorable economics for dairy plants, and ever higher costs of expanding an existing plant or building a new plant, is the building “boom” over? If the new capacity is to handle growing milk supplies, then the answer could be “yes” as milk production growth has slowed in most parts of the country due to unattractive dairy farm margins. However, if the new capacity is to fulfill new demand, either export or domestic customers, then those investments are likely to continue. New plants are being built in Michigan to help absorb the oversupply of milk in the state. Surplus milk has been hauled out of Michigan for several years. As a result, dairy farmers in the state have seen their mailbox milk prices drop to among the lowest in the United States. And the cheap milk has caused premiums in nearby states to drop as well. By late 2018, the new Foremost Farms facility will condense more than 3 million pounds of milk per day with future plans for up to 6 million pounds. The big news recently was the announcement of a location for the new Glanbia joint venture cheese plant with Dairy Farmers of America and Select Milk Producers. Michigan produces 30-32 million pounds of milk per day, so this new capacity, along with smaller additions at several other plants, represents nearly 50 percent of the state’s milk production. By late 2020, when the Glanbia plant starts up, much of the milk currently leaving the state will remain in state for processing. This has important implications for the Upper Midwest milk market and premium levels. Without a steady stream of milk selling below class, milk premiums in Wisconsin are likely to increase, but probably not back to $1 per hundredweight or higher. This will alter the economics of plants that have been buying cheap out-of-state milk for the last several years. While some fluid milk plants are closing, others are being built. Walmart’s new fluid milk bottling plant in Indiana has raised the ire of some dairy farmers. Dean Foods terminated milk supply contracts with more than 100 farmers in eight states in February and the loss of Walmart private label milk sales was noted as one of the reasons. By May, Dean Foods announced the closure of seven plants. Even as fluid milk consumption continues its long-term downtrend, rumors have swirled about the potential for additional Walmart plants around the country. If that happens, there would be additional concentration in the fluid milk processing sector with fewer, larger, more efficient plants handling most of the fluid milk bottling. While the “white gallon” segment contracts, more specialized milks are experiencing demand growth. fairlife continues to be a success story. With plants in Michigan and Texas, the company is adding a new plant in Arizona in 2019. Aurora Organic Dairy is building a $100 million plant in Missouri that also is scheduled to open in 2019. And HP Hood is investing more than $200 million in refurbishing a plant in New York to produce extended shelf life beverages. After seeing a period of low investment due to unprofitable economics, cheese plants have seen a wave of expansions in the Upper Midwest over the last year that is continuing into 2019. The largest capacity addition is the Agropur plant in Lake Norden, South Dakota, that is tripling its daily milk intake from 3 million to 9 million pounds. AMPI has expanded two plants while Valley Queen and First District both made improvements to grow their plant capacity. With these additions, and the new capacity in Michigan, the milk supply and demand outlook in the Upper Midwest is expected to swing back to being more in balance. Until recently, the majority of new investment in milk processing was in milk powder plants, mainly in the West and Southwest. From 2008 to 2017, production of nonfat dry milk and skim milk powder grew nearly 475 million pounds or a 25 percent increase over the decade. However, as the global market for milk powder turned to surplus, prices plummeted, as has interest in building additional capacity. In fact, two milk powder plants in California have been shuttered this year, and several other plants are experiencing lower volumes and reduced operating schedules. One cannot talk about dairy plant capacity without also mentioning the role of make allowances in the Federal Milk Marketing Order (FMMO) price formulas. I’m old enough to remember the debate about moving from the Basic Formula Price (BFP) to product price formulas in the late 1990s during federal order reform. California has used product price formulas for decades, but that system, along with annual manufacturing cost studies, goes away Nov. 1 as California becomes a new FMMO. The manufacturing cost data used in the FMMO formulas date back to 2005 and the make allowances have not been updated since 2008. Obviously, production costs have changed in 13 years, so there is a need for a more frequent update of manufacturing costs. Recent comments from USDA indicate the process has started to collect current cost data, presumably to be used as the basis for an upcoming hearing on make allowances. Not surprisingly, there is never a good time for dairy farmers to see an increase in make allowances, which results in lower milk prices. However, when cheese and butter-powder plants are operating at losses, and returns aren’t high enough to attract new investment, changes are needed. I expect more discussion on this topic and a call for a national make allowance hearing in the next year. Looking ahead, with continued growth in cheese demand within and outside the United States, I expect cheese production capacity to continue to be added, both by existing companies and new entrants. Once the new Select Milk Producers plant opens in Texas next spring, there appears to be a lull in new plant investments in milk powder as no new greenfield plants are under discussion to my knowledge. Uncertainty over trade tariffs will most likely stall investments in the near term. As yogurt demand and production have flattened, that sector likely has enough capacity to handle current demand. Capacity for fluid milk will increase to accommodate new value-added products and retailers’ desire to have large, efficient plants, but this will most likely result in additional closures of existing milk bottling plants. At a panel discussion in January 2017 at IDFA’s Dairy Forum, I said the United States had a strong outlook for milk processing investment over the next few years. But today, that outlook is not as bullish. Until market fundamentals and plant economics improve, and trade uncertainties are resolved, I anticipate a slow down in processing capacity growth and for milk supplies to catch up to the new level of milk processing capacity in the country.